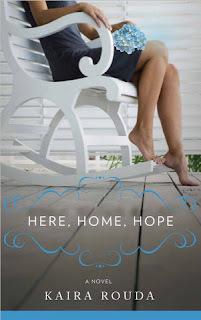 In May, Kaira Rouda published her debut novel Here, Home, Hope (Greanleaf Book Group 2011). She has a background in business and is the author of a book about female entrepreneurship. So I had to ask Kaira: how had her experiences in entrepreneurship prepared her for the hustle that is book publicity? Is it easier to be “out there” with your fiction if you’ve learned to put yourself “out there” already? Thanks for having me as a guest, Sarah! Your question is a great one, as is the corollary: Which book is easier to promote, the nonfiction or fiction? To answer your questions, I’ll start from the beginning, which for me is third grade and a letter I wrote to my then favorite author – Robert McCloskey – telling him I wanted to be an author just like him someday. He wrote back and thanked me for the note, informed me he was an illustrator not a writer, but wished me well. That’s the essence of publishing today, I think. Nothing is what it seems, nor is anything the way it was only five (maybe even two) years ago. Ironically, my career in residential real estate marketing and leadership actually prepared me for the flux that is publishing today. I joined the real estate industry at its time of biggest change, the dawn of the internet age and the open access to information once held closely by agents and brokers. I had the unbelievable privilege of creating the first female-focused brand in real estate, one agent, one brokerage at a time. Much of that experience is embedded in my first book: Real You Incorporated: 8 Essentials for Women Entrepreneurs (Wiley 2008). It was never my dream to write a business book first. But the process of writing and publishing Real You Incorporated - encapsulating and explaining personal branding and its extension to business branding - has helped me to achieve my dream. Because of my business book, I built my platform. Because of my business book, I became more comfortable with public speaking. And because of Real You Incorporated, I had a hint of what was to come when my novel came to life. That said, fiction is a completely different animal. It’s personal. It’s not your story, but it’s definitely your world view. Everything is subjective. Everything is open to interpretation. The negative reviews hurt a little more and linger much longer. Criticize my method of putting the real you in your business; fine. Criticize a character in my novel; it’s a stab in the heart. It’s pretty easy to encapsulate and talk about a business process, a business book. About facts. I didn’t realize at the time how much easier nonfiction is to promote than fiction. Now I do. One of the reasons authors write is so we don’t have to speak. But, the fact is, if you don’t talk about your book – whether fiction or non – no one will know about it. Today’s reality is platform and access. The bigger your platform, the more book sales you’ll chalk up. The more folks who have access to your book (read: distribution, which still today is controlled at the brick-and-mortar level by the big publishers), the more sales. Sure, a purist may say look at the lucky titles, the best-sellers. A closer look will reveal much hard work on behalf of those overnight successes, with a very few exceptions. That’s the reality. As in real estate, you have to make your own luck, build your own brand. Throughout my career in marketing and journalism, I always hoped that someday I’d see my novel on the shelf in a bookstore. I didn’t know how hard it would be to make that dream come true. A Barnes & Noble buyer can choose among 4.1 million titles to order into her store, which carries on average 90,000 to 120,000 titles. I’m so grateful Here, Home, Hope is available at some B&N stores. If I encounter a B&N that doesn’t have my book in stock, and I’m in the area, I will go in and introduce myself, drop off a card and ask to speak to the book buyer. I know, even though my novel is published by a small press – an independent – I have a tough job convincing some independent book stores to take a chance on my debut novel. When an independent book store owner embraces my novel, it means the world to me. I’ve learned that the most supportive people can be those who you least expect; and that those who you expect to be your biggest fans can let you down. This summer, I’ve been in 17 states, on a book tour, based on where my friends would host book parties! That way, there was a party already going on and we’d invite a bookseller to sell books. That was a great way to meet the amazing booksellers in many different towns across the country. So fun! If you want it, this career as an author, it is up to you to make it come true. There are more options than ever to get your words into the hands of readers. But that is truly just the beginning. Since turning in my completed manuscript to my publisher a year ago, I have spent 90 percent of my time marketing Here, Home, Hope. Do I dream of someday having a big publisher behind my fiction? Yes. It’s lonely as an independent. But I know many authors with big publishers who face some of the same frustrations and challenges surrounding publicity and spreading the word. I do know, doing it this way, I have learned countless lessons. I’ve come to terms with the fact that book publicity is a never-ending process, no matter how your book comes to market. It’s about building a platform. It’s about connecting with others who love reading and writing. (In fact, the other women writers I’ve met through this last year’s journey have been some of the most fabulous, supportive people I’ve ever had the privilege to meet.) It’s about accepting rejection, but continuing to expect success. It’s about continuing to write, cheering other writers on and stubbornly believing that you deserve it, that your work has value, no matter what. Consistency, connections, follow up. There is no secret formula, just hard work. Kaira is an award-winning entrepreneur, marketer, speaker and author. She is the bestselling author of Real You Incorporated: 8 Essentials for Women Entrepreneurs (Wiley), founder of numerous companies including Real You, and brand creator of Real Living Real Estate, the nation’s first women-focused real estate brand. In late 2009, and with the help of a tweet, Kaira helped orchestrate the sale of Real Living to Brookfield Residential Property Services. Kaira remains brand strategist and consultant for the company. Her first novel, HERE, HOME, HOPE (Greenleaf Book Group) was published in May of 2011, and won a 2011 Indie Excellence Award for fiction. Thanks for an excellent post, Kaira. What really comes through is your positive attitude, a lesson in itself!